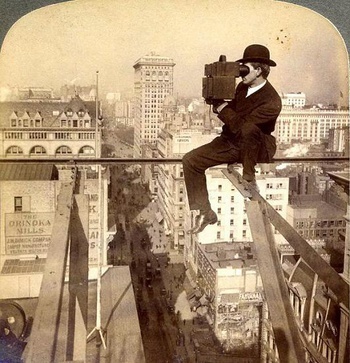 In Photographs > Stereoview Photographs > Show & Tell and Cameras > Box Cameras > Show & Tell. 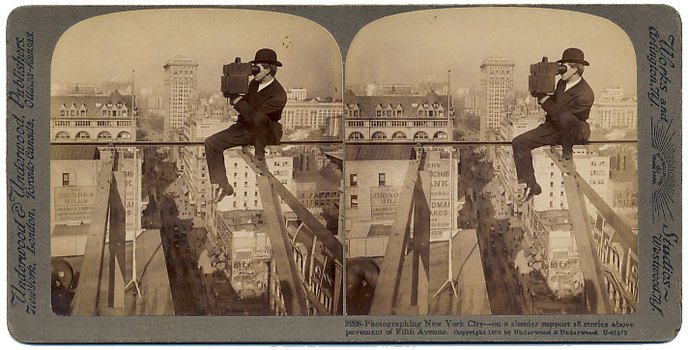 I just acquired this famous 1905 stereoview of a photographer sitting on a narrow girder and shooting New York City 18 stories above Fifth Avenue using a stereo Graflex. What some people did for great photographs! One of my favorite camera images! Thanks AmberRose, officialfuel, and Scott! Scott ... one of my favorites as well. I've been trying to acquire an excellent condition version of this stereoview for years. I have been in the same boat! I used to do regular ebay searches using the image number, hoping to find a hidden one. They often bring $50+ on ebay (regularly brought about $100 about 5 years ago) and I cannot bring myself to spend that kind of money for a mass produced image. I have lost out many times on ebay as I don't want to pay more than about $20! Are there examples of the photos he took up there? Great acquisition! Makes me dizzy just looking at it; how did he get out there with that camera in the first place? Hi vetraio50 - thanks for looking and the question. I've wondered the same thing - if there are pictures by the photographer. If you think about it, there are two photographers 18 stories above the pavement. I wish I knew their names because we could then look for images by them. Thanks, Phil. I too keep looking at staring at this image. I think we can safely say that this guy (or the guy taking his picture) took most of the NY City views from the Underwood Series. There are many similar views in the Series-- street views shot from a building. Awesome, Scott! Your thoughts make a lot of sense. Thanks musikchoo, bratjdd, Longings, sanhardin, and blunderbuss! Thanks Chevelleman69, AntigueToys, and leighannrn! This is just a thought. I don't know if this will be helpful or not. If you type in on the Google site: 'Above Fifth Ave. looking North". You will get many pictures of the above photo. Also you can call: The Museum of Modern Arts @ 1-212-708-9400. They maybe able to give you the photographers name. Thanks for the comment, Kathycat. As you can see, the image is quite famous and I've always wanted an original photograph. As far as figuring out the stereoview photographer and the guy on the girder, I'll start by contacting the technology curator at the George Eastman House. I know him quite well. Thanks MooreAntique, egreeley1976, trukn20, chrissylovescats, and mtg75! I suspect this image was mostly "showmanship" to create interest in the series. It gives the impressions that photographers were risking their lives to photograph the city views (and in this case, there does appear to be some serious risk)! However, I would think that MOST of the city views were photographed from rooftops and windows. I'd appreciate any information that your friend with Eastman House may be able to offer. Scott ... I was thinking the same thing. eye4beauty ... in the grand scheme of things, the camera is somewhat large but not overly so. Otherwise, I've contacted the George Eastman House and will post anything of interest. Finally-- I just got a reasonably priced copy of this image! I have been after one for a while. Awesome, Scott! Did you acquire the stereoview or single image? It took a while but was worth the wait (as I am sure you know). Thanks, electobacco! Yep ... I guess being well-dressed helps a lot. LOL. Hi filmnet ... yep ... this image has been reproduced for more years than I can recall. As I noted it's an iconic image; but it's always nice to own an original example. Original stereoviews appear on eBay from time-to-time.